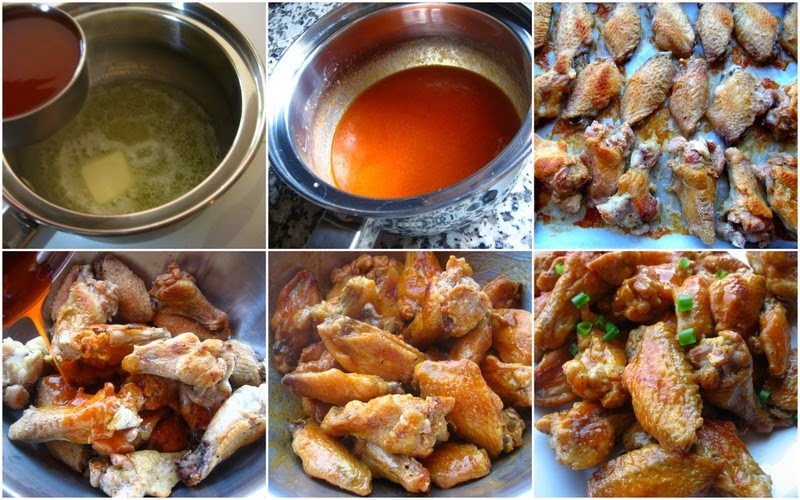 Home » Appetizers » chicken » Gluten-Free » Main Dishes » Crispy Baked Chicken Wings(II)... using baking powder. Crispy Baked Chicken Wings(II)... using baking powder. Crispy Baked Chicken Wings(II)... using baking powder. So here is the second recipe I promised to share awhile back... where you can bake up some delicious crispy chicken wings. No frying involved. This method involves using baking powder to crisp up the chicken skin. It's all science, but the result is fantastic. In a nut shell, the baking powder draws out the moisture, breaks down the protein and helps the meat brown. All this gives you the crispiness we enjoy from fried wings... but without actually frying. The method works... and makes for some wonderful hot wings! I first came across this method a year or two ago but finally managed to make it recently. While the method used only 3 ingredients (chicken wings, baking powder and salt) , I managed to add my own personal touch... adding a bit of pepper and potato starch to further reduce moisture. This is the recipe I'm sharing today, but feel free to skip the potato starch. It works without it. I ended up looking at a couple of recipes and decided to combine them... used the lower amount of baking powder found in one recipe and applied the baking technique of the other recipe. And in the end I managed to make my own version and liked the result. Note: While I posted 2 different temperatures(Cook's Country version), I've also done these wings at 450 deg F as well, with wings having an overnight rest in the fridge uncovered. Baking time will vary, but they bake up nice and crisp by 40-50 minutes or so... Either way you choose, the result will be crispy wings:). You will need: inspired by SeriousEats and Cook's Country. 1. Cut up chicken pieces into flats, drumettes, and wing tips. Reserve tips for stock by freezing them. 2. Mix salt, baking powder, potato starch and pepper in small bowl. 3. With a paper towel blot chicken pieces from excess moisture. 4. 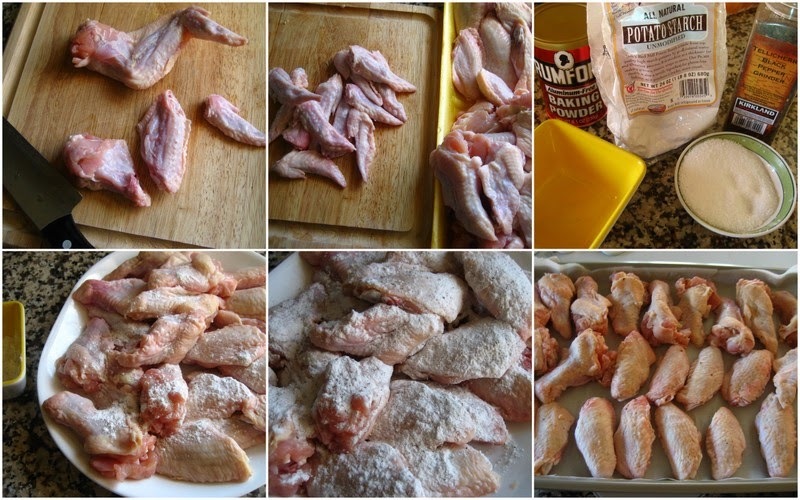 Sprinkle baking powder mix all over wings, coating evenly. 5. Line a tray with parchment paper and place wings in single layer without overlapping. (alternately place wings on a rack and then place them on a baking tray. 6. Place wings in fridge for several hours... this helps the wings dry up further. I placed mine in the fridge in the morning and baked in the evening... about 8 hours later. 1. Combine melted butter and hot sauce. Set aside until needed. 2.. Bake wings for 20 minutes at 275 deg F, then increase heat to 425 deg F and continue cooking for another 45-50 minutes, or until wings are nicely browned and crispy. Note: If you feel the wings aren't browned enough, increase heat to 450 Deg F the last 10 minutes of baking. 3. Remove wings from oven and place in a large bowl. Drizzle hot sauce over wings and toss to coat. Serve immediately.